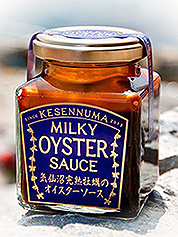 SENDAI, Japan — Fishmonger Hisashi Ishiwata's signature product — Kesennuma Milky Oyster Sauce — is the poster child for a creative seafood industry resurgence here in the region devastated by a massive earthquake, tsunami and nuclear power plant disaster nearly eight years ago. Today, Ishiwata Shoten Inc. sells more than 150,000 jars of the creamy sauce that tastes like lightly salted balsamic vinegar each year to markets as widespread as Southeast Asia and the United States. But the sauce didn't exist in 2011, when the deadly tsunami and subsequent nuclear accident wiped out the fishing sector in the Tohoku region of northeastern Japan. Fishmongers like Ishiwata were forced to be creative in order to survive. "These products are products that we came up with after the disaster," he explained, pointing to the sauce, a bottle of oyster dressing, and an oyster-derived oil for cooking and flavoring. "Oyster sauce can be transported even under room temperature. It's easy to keep longer. Of course, it's fine within Japan, and it's also fine to export it long distances abroad." The 9.0 magnitude tremor struck just offshore from this port city, the capital of Miyagi Prefecture, leaving scars — both physical and economic — still visible in Sendai and the surrounding towns. The tsunami destroyed most of the coastline and the local fishery. Of the almost 20,000 people killed throughout Japan, Miyagi Prefecture suffered the most casualties. The nuclear power plant accident that followed in nearby Fukushima Prefecture was a double blow as longtime customers shunned Tohoku seafood. The fishery is almost fully rebuilt now, but the Fukushima Daiichi nuclear accident has dealt more permanent reputational damage. More than seven years have passed since the disaster, and Japan's nearest neighbors still refuse to eat Tohoku's food, especially its seafood, despite government evidence that shows it's safe. Fishing for export was a main economic engine for Miyagi communities like Kesennuma and Ishinomaki before the tsunami. But now, traditional customers in China, South Korea and Taiwan — the largest Asian markets — have shunned them. "China right now has still stopped importing seafood production from a wide region, including Miyagi Prefecture," said Maki Sawada, chief of the Sendai office of the Japan External Trade Organization, or JETRO. "South Korea has also stopped importing, depending on the products. No matter how much evidence JETRO provides showing that these products are safe, it doesn't go anywhere. It's extremely difficult to get them to accept products from Tohoku." That mindset is why Miyagi's fishing industry not only had to be rebuilt, Ishiwata explained, it had to be completely reinvented. The Kesennuma oyster sauce and other examples displayed at a recent regional trade fair here were designed to get around the embargo on Tohoku seafood and to find new markets farther afield, like Europe and North America. 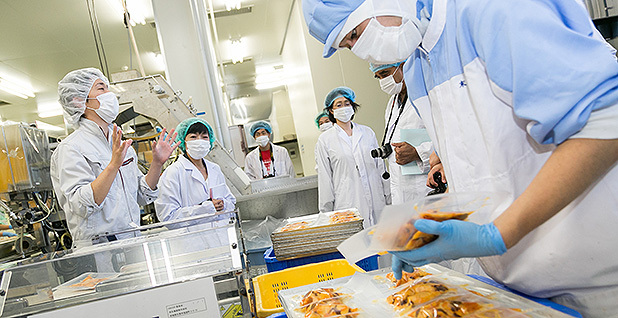 The Tohoku region's seafood product exporters are forging new ground in Southeast Asia. And they've shifted their marketing and product strategies. Raw seafood, once the region's mainstay, is now nearly impossible to sell. Kesennuma continues to celebrate its heritage as a raw oyster town, holding an annual Oyster Festival in November. But Ishiwata and others admit that few outside the region would consume Tohoku's oysters on the half shell. Processed seafood is what sells these days, and those sales are happening in markets that would have been ignored were it not for the Fukushima disaster. For Ishiwata Shoten, it's oyster sauces and dressing. For Maruse Akiyama Shoten Ltd., it's packets of dried salted fish flavored with seaweed. Marukichi Kobu Shoten is trying its luck with a konbu-wrapped mixture of processed, preserved fish. Like the oyster sauce, these products can be stored and shipped for long periods of time. They remain edible in places that don't necessarily have reliable cold storage facilities, making them ideal for export to developing world markets. With wealthier customers in South Korea, Taiwan and China now out of reach, Tohoku's fish sellers have looked instead to Indonesia, Malaysia and Thailand. Chie Sugawara, a businesswoman in Ishinomaki, markets her smoked and pickled seafood delicacies in France. "In 2013, we weren't sure if we would be able to sell it, so we didn't even make 1,000 units," said Ishiwata, recalling the birth of his oyster sauce. "We sold out in eight months." Sales have expanded to approximately 160,000 jars each year, he estimated. "We're now going to America and gradually expanding." Indeed, many here are working feverishly to open up new export opportunities in the U.S., which explains the red carpet treatment given to a Chicago-area importer visiting the Sendai trade show. "We're OK to export to America as long as we follow their requirements," Sawada noted. "But as of now, the volume of exports to the U.S. is quite small." The recovery shows in JETRO's statistics, as well. 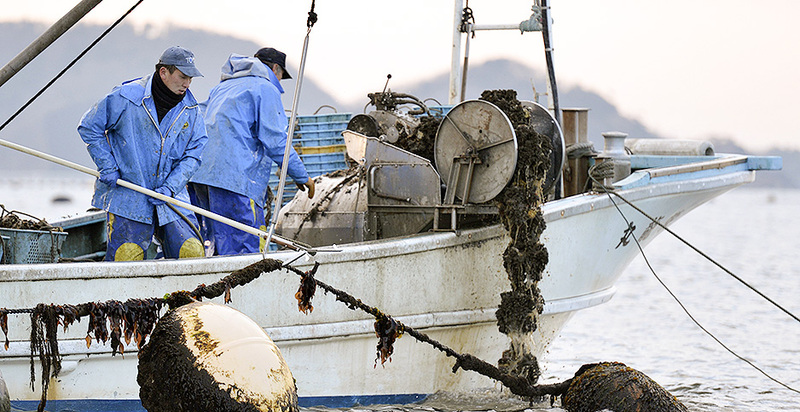 In 2010, the Tohoku regional fishery sold about $160 million worth of seafood. In 2011, the year of the tsunami and nuclear disaster, that figure had plummeted to around $63 million. Last year, JETRO estimates the region's seafood sales reached close to $178 million. The statistics hide expensive structural changes, however. Products are more difficult to make, and target markets are harder to manage. Longer trade routes mean higher shipping costs, all of which cut into companies' bottom lines. And the burden of regular safety tests required by the governments of importing countries adds to the financial hit. "We've achieved some results from presenting our evidence, particularly with Vietnam and Thailand," Sawada said. "But we have to continually present to them evidence concerning radiation safety, and that's expensive and time-consuming." To sell to the U.S., Tohoku's seafood sector must comply with Food and Drug Administration requirements. The manual JETRO handed out at the Sendai event summarizing FDA compliance is 50 pages long. "Miyagi and Fukushima are doing it, but it creates a lot of burden for them," Sawada said. "Unless they show evidence that the levels of radiation are safe in these products, they cannot import them." Kazuo Noda said he and other volunteers organized the Tohoku Reconstruction Fishery Products Exhibition in order to survive. "People were lost, businesses were devastated, and infrastructure was destroyed," he said. "To go on living, people have to continue doing what they were doing, I think." The CEO of a fish cannery in Hachinohe, Noda recalled how the tsunami almost completely destroyed Tohoku's fishery. It is about 80 percent recovered now, he estimates, and should be completely rebuilt by 2021. But the nuclear accident left the industry's customer connections crippled. A flyer advertising the exhibition highlights the challenge. Though nearly eight years have passed, "lost customer and supply networks and reputational damage has delayed a recovery in sales," it notes. "The mere impression that there is radiation, and what that does psychologically to people," Noda said, is the main obstacle to full recovery. "There is data on that coming out every day. For five years now, it has been shown that there is no problem, and we continue to collect and distribute data every day," he said. "No matter what we do, no matter how far removed people are, we're still seeing that big psychological problem of people thinking of Fukushima and Tohoku as dangerous." Ken Fujimoto, a special researcher with Japan's Fisheries Agency, stressed the safety of the seafood in a presentation, which also included his advice on how to talk to potential customers about Fukushima. Monitoring for signs of radiation in the ocean near the site of the crippled power plant occurs daily. For years now, readings show that over 97 percent of waters closed during the emergency are now totally clear, said Fujimoto. For the most part, Fukushima radiation cannot be detected at all. 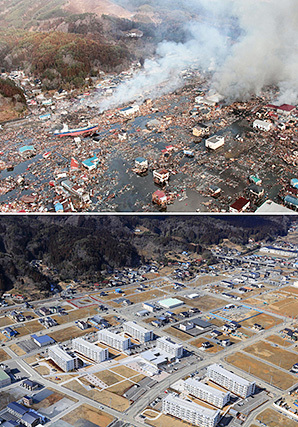 "Of course, at the time of the disaster the measurements showed quite high concentrations," Fujimoto said. "But starting around 2013 and 2014, we could not detect anything beyond the normal background range, either to the north or south. And from 2015 on, even when looking at the surrounding three area provinces, including Miyagi, no change has been detected." But it doesn't matter. "Fukushima still can't sell its products," Noda said. "The data on radiation show there is no issue, but we still run into problems with selling." The fear propagating throughout Northeast Asia of potential radiation poisoning is so great it has prompted South Korea to completely ignore a ruling issued against it by the World Trade Organization, concluding that Korea's total ban on Tohoku seafood violates international trade rules. Despite the hardship, fishermen and exporters in Tohoku are optimistic as sales have recovered and the industry has adapted to a new normal. After the tsunami, Sugawara, the Ishinomaki entrepreneur who exports to France, opened La Sagesse Japon. She sells seafood delicacies in three languages: English, French and Japanese. She's particularly proud of her Alice de Sanriku line of products, featuring jars of pickled smoked oysters and cod roe. Business is picking up, but painful memories linger, she said. "I lost my home, I lost everything. My family was fine, but all my neighbors were lost. It was a big shock," Sugawara said. "It was incredibly hard. I still cry sometimes." She spent several weeks in France after the disaster to escape her depression. But she was determined not to give up on Ishinomaki and Miyagi's fishing industry. Her new business launched a couple of years ago. "Lots of customers came. The newspaper turned up to do a story. Thanks to all their words of encouragement, I've been able to relaunch," she said. "Now I'm OK to let myself have some fun, smile, go back to France every now and then." Sugawara considers herself lucky. "There are people who lost their entire families, people who committed suicide," she said. "I had no hope, but I persevered. "Depression is really something. But now I'm creating new products." Anglers urge Inslee to gut gill net policy in Wash.